If there’s one thing the Germans seem to love, it’s explaining the obvious. Yep, you might think that your folks did a pretty good job toilet training you all those years ago and that you’ve been using toilets successfully ever since, but that is clearly not good enough for our German friends. Oh sure, they try to educate in “humorous” ways, but really, anyone who puts this amount of thought into the correct usage of toilet facilities is not messing around. There is then an entire laminated A4 page of instructions, which, if you actually took the time to read, you’d probably wet yourself. Two things spring to mind: firstly, did the people who do have their workplace in the office get some sort of special training which makes them exempt from reading the instructions? And secondly, did the Board members really take time out of their day to come up with a list of instructions, type them up and then laminate them? If so, that is some classic German efficiency right there. You might think it goes without saying but never, EVER, pee out of your shoulder while holding your arms out wide. 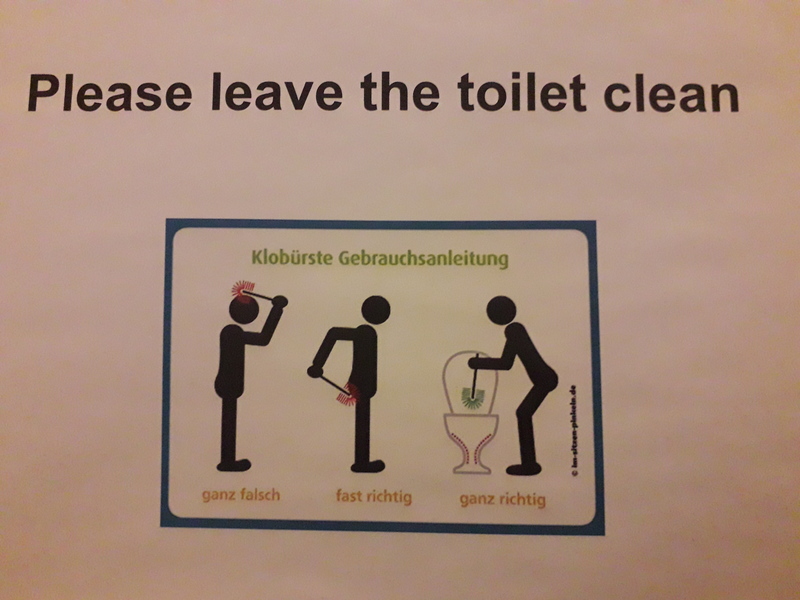 The Germans will not think you’re big or clever and there’s a fair chance you’ll end up peeing on your own hand – serves you right. Instead, perch on the edge of the toilet seat, hold an imaginary book, point your toes towards the ceiling and let rip. At least I think that’s what it means. 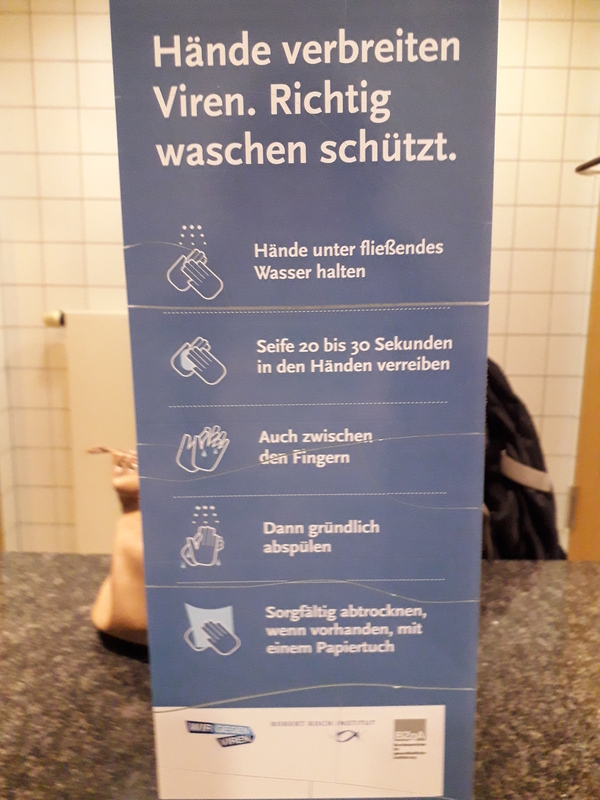 It’s no secret that the Germans like a good agenda – so much so, that they’ve even come up with a 5-point agenda for washing your hands. No, you filthy creature, you will not be spreading your dirty viruses on German soil. You will follow the agenda! Put your hands under running water (as opposed to unrunning water? ), soap ’em up good and proper for 20 to 30 seconds, also between your fingers, rinse thoroughly and dry your hands with a paper towel. Got it? No? OK, here’s a more simplified version with no words and bigger pictures. Finally, one thing you’ve probably been using incorrectly all your life, is your toilet brush. Not to worry, the Germans are here to save the day. No, you silly billy – don’t use it to brush your hair! Ganz falsch! Ah, there you go! Yes, toilet brush for use on a toilet. Oof, the relief of finally figuring that out. I’d been wondering why my hair always smelled a bit funny. Thank you, Germany. I’d never have got there without you. And now, dear reader, go forth and pee with Germanic abandon. But remember, not out of your shoulder. Previous PostFalling shortNext PostSend me your stories! 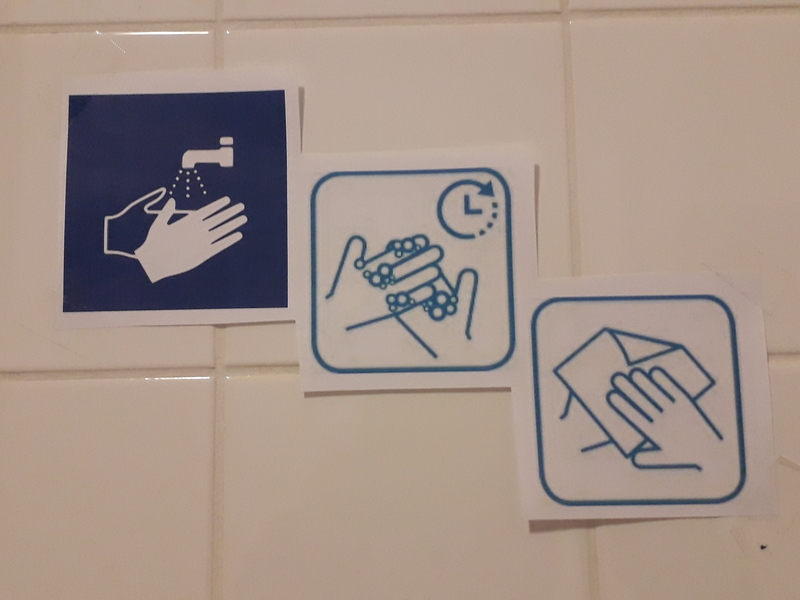 I’d love to have these signs in English at my workplace. 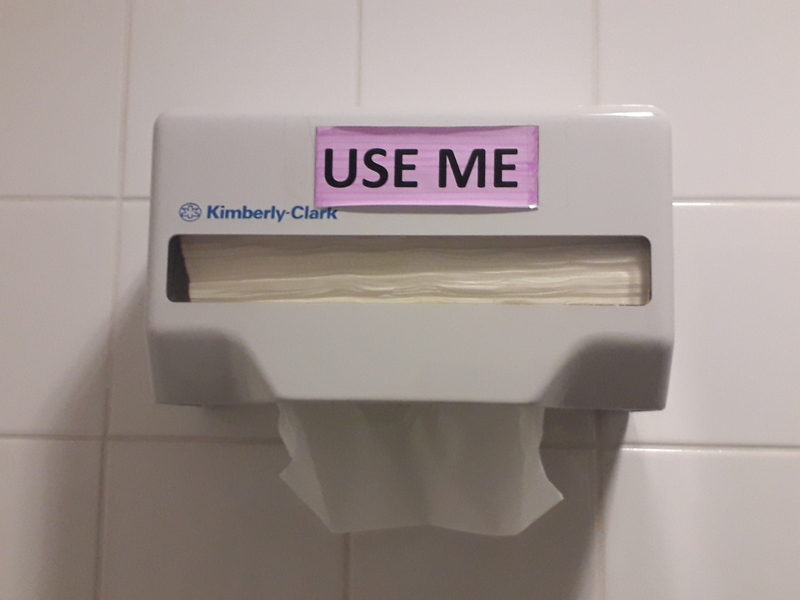 I work for a health department and you would think people would be all about hygiene but … ah …. no. 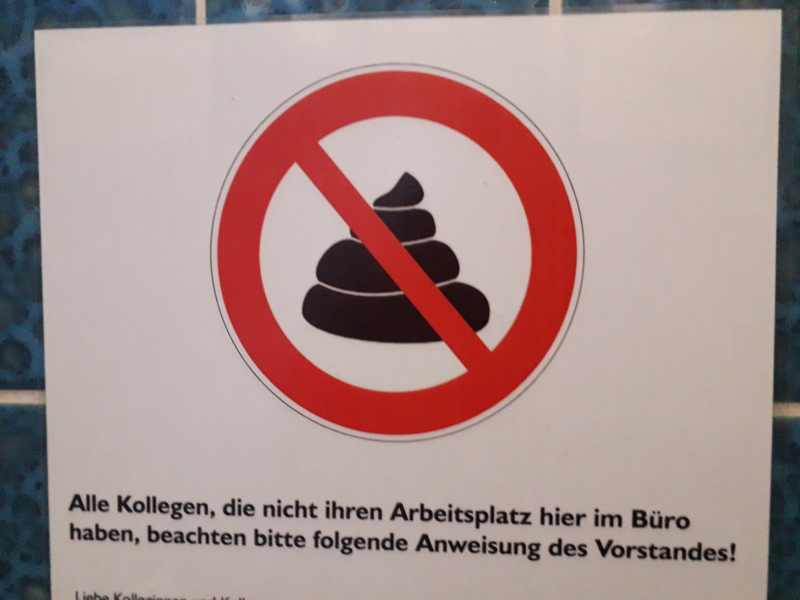 I can only speak for the women (of course), but I am always amazed how many women do not wash their hands after peeing or pooping, dispose of paper towels in the toilet even when there are signs saying not to (we are NOT good Germans over here), and … wait for it … do not flush. Gross!!!!! Yeah, there’s only a certain level of disgusting we should have to cope with 😉 Your husband should introduce the Sitzpinkel – might help! I need the last one for my office. You wouldn’t think it would be so hard to use a toilet brush, but you would be wrong. So, I did LOL at the brush one – that’s pretty friggin cute. Mission accomplished? 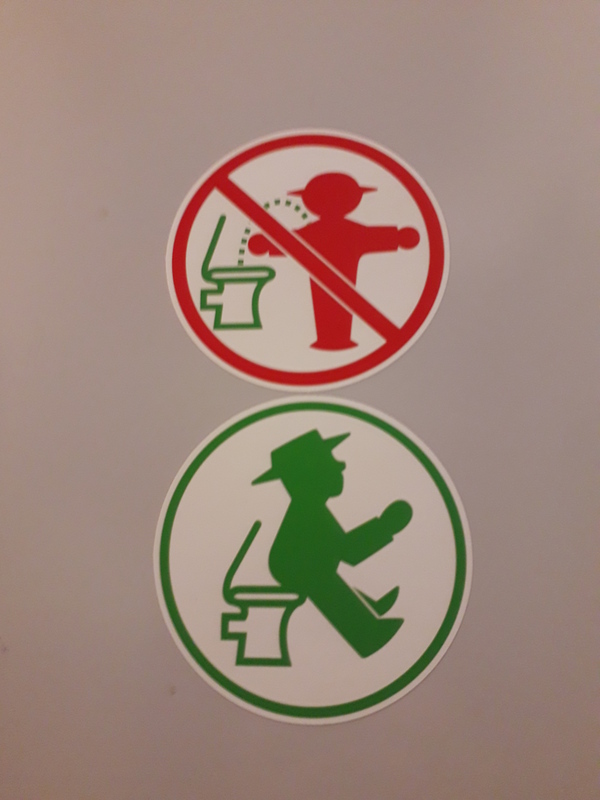 While they’re explaining things, they might want to tell that little guy perched on the edge of the toilet seat that it’s wise to take his pants (trousers, both, whatever you want to call them) off first. It gets messy otherwise. Ha ha ha! Yes! Well-observed – I missed that one! You? Missed something? Hard to credit. Nope. You’re too early, and you don’t want to waste your life standing around waiting. They used the Ampelmann – that’s great! I was in Berlin last month, he’s an icon! That he is! Still find him ridiculously cute even after 4.5 years! They do love explanatory signs in the bathrooms here! We have some icky ones at my workplace. Have you heard about the one that tells men to sit down while peeing?? The toilet brush one always cracks me up! Hahaha yes looks like he’s going to fall off!